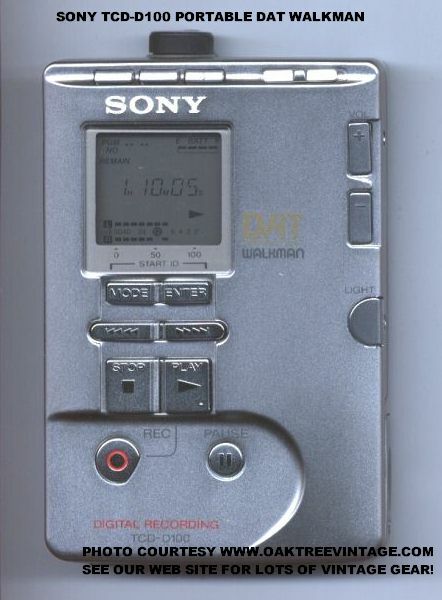 - Up to 3.5 hours recording / playback time using the re-chargable Ni-MH batteries (included). Longer times possible with Akaline 2x AA batteries. - Back-lit, LCD display indicates operating status, Record / Playback levels, battery life, etc. - "HOLD" / Lock switch to prevent accidental recording "screw-ups"
We can't say enough about the performance of this deck. You won't be disappointed. Measures 4 5/8" x 3 1/8" x 1 1/4" and weighs only 11 ounces unpacked! Pretty much the same size as a typical Sony Walkman Cassette Decks. Includes our standard 90 day limited warranty. $599. W/ All the extra stuff listed above. *With the exception of the DAT cleaning tape, this no longer includes the DAT tapes in the photos.